As a professor of British literature, I consider it my duty to stay up to date on UK television, at least anything involving horses and monarchs. Granted, I teach Renaissance British literature, so it probably would not be necessary to watch Call the Midwife, a series taking place in the 1950s and 60s—but never mind. I’ve watched through the six seasons of this beautiful show with perhaps excessive enthusiasm. The show’s title makes it sound like one of those silly British slapstick comedies, but no. I would describe it as an historical drama with a loving heart. It has the same historical-immersion appeal as Mad Men, except with wholesome values, lots of babies, and nuns. This history factor alone might explain its popularity in Britain—nine million viewersstrong and renewed now for an additional three seasons (or “series,” as they say). Not being a Brit, I’ve been wondering why I feel such keen hunger to immerse myself in this world. I think I’m drawn to that historical component, too, because it connects me, admittedly indirectly, with the period of history just before I was born, when my parents were young adults. The show is based on the memoirs of Jennifer Worth, who worked in the late 1950s as a midwife in the Poplar neighborhood of London’s East End, a poor and working-class area devastated by the Blitz and populated largely by people connected with dockyards and warehouses on the Thames. Worth was among the young nurses who lived and worked with an order of Anglican nuns in the district, nuns whose religious vocation included nursing and midwifery. These women together, nun-nurses and non-nun-nurses, essentially were the health care system for the neighborhood, at least for primary care. They clattered around on bicycles—covering an eight-mile-wide, densely populated area—making house calls, helping with up to a hundred births a month, running clinics, and acting as advocates and quasi-social workers. Producer Pippa Harris and writer Heidi Thomas collaborated with Worth before her death in 2011 to develop the TV series, making every effort to create historically accurate sets and costumes and to portray current medical practices correctly. Even after the first three seasons, in which the writers covered the events recalled in Worth’s books, you can imagine that this setting and premise provide an endless supply of interesting characters and storylines. The historical issues addressed include the lingering aftermath of World War II, especially the Blitz, and the beginnings of the British National Health Service (founded 1948). But numerous medical issues dramatized in the show were current in America as well: polio and other vaccinations, nitrous oxide during labor and delivery, the beginnings of oral contraception, the thalidomide scandal, improved mental health care, and so on. Apart from the medical business, the show indulges lavishly in matters of fashion, popular culture, and especially music. Every episode features popular songs from the year in question—songs I recall my parents singing. So I find myself better understanding my own mother, who gave birth to my brothers in the 1950s. This was her world, except just across the ocean. Jessica Raine, the wonderful actress who plays Nurse Jenny Lee (the character based on Jennifer Worth), even looks like my mother did in her 20s. It’s uncanny. I also appreciate the show’s respectful and overall genuine portrayal of faith. The nuns are pious in the best sense, each with a distinctive character. Sister Evangelina can be gruff and cross, but she will get the job done. Sister Monica Joan is getting older, sometimes trying everyone’s patience and sometimes delighting with her poetically weird wisdom. Sister Julienne is the steady and gentle hand at the helm. Sister Winifred is twittery and cheerful. Meanwhile, the show frequently depicts the nuns’ routine of daily prayer, their devotion to their work, and quite often their struggles. They see plenty of suffering, and they sometimes doubt or feel shaken or puzzle over what God is up to. But they hold each other up and stick to their prayers. They trust and get back to work. Watching the show is a deeply woman-oriented experience, which is no doubt also part of its appeal. It’s chock full of terrific female characters of all ages, not just the nuns and nurses, but also the birthing mothers and the various women in the neighborhood. As for the birth scenes, be prepared. Every episode includes at least two or three births, vividly portrayed with messy fluids, much maternal groaning and yelling, and bloody baby heads emerging from between bare legs swathed with discreetly arranged sheet or nightgown. Alternating with the gross-out scenes of womanly drama, we get to enjoy the fun girly scenes among the non-nun-nurses as they gather in the kitchen for Horlicks (look it up; I had to) after a long day or prepare for a night out by spinning records, testing outfits, and drinking “Babycham” (look it up; I had to). In fact, the show is so very girly that my husband claims he has no interest in watching it. I think he’s just afraid of womanly fluids. Admittedly, it’s a little sentimental. Probably the convent is a little too harmonious. Probably the nurses are a little too inexhaustibly compassionate. The short voiceovers at the opening and close of each episode, voiced by Vanessa Redgrave as “the mature Jenny Lee” in nostalgia mode, amount to a kind of sentimental word salad: “love,” “community,” “pain,” “young,” tossed together in varying order. On the other hand, perhaps that sentimentality is exactly what appeals to me most. Yesterday, I was chatting with a colleague from my college’s nursing department, and I mentioned I was watching this show. “Oh!” she exclaimed. “It makes me long for the past!” We agreed that even though medical care has advanced by many miles since the 1950s—and we wouldn’t give that up—there was something about this portrait of women in community that made us sigh with longing. Here are these passionate professional women, caring for each other and looking after hundreds of women in their circle of care. These nurses knew their patients well, knew their neighborhoods and families, knew the complex web of relationships and conditions that influence our bodies’ health—and our souls’. That’s the question, isn’t it? After I spend a whole day putting up with rancor and conflict and crudeness and cruelty in our public life, I flop on the couch at night and wonder: Where is the tenderness? In both senses: the tenderness that reveals where our wounds might be, and the tenderness that cares for those wounds. This is going to sound like one of those sentimental voiceovers, but I long for more tenderness right now. I want to live in a world where people maintain their faith and integrity and passion and gentleness in the face of every trouble and sorrow. Where they care for one another with minimal judgment and maximum compassion. Where they speak soothing words when needed, but also, when the situation calls for it, urge “You’re doing reallllllly well! One more biiiiiig push!” And of course, where just about every crisis can be eased by putting a pot of water on for tea. 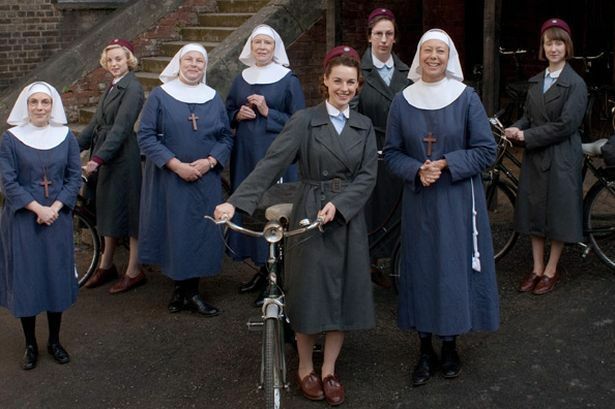 Call the Midwife airs in the US on PBS stations and is available on Netflix.